NMSBVI highlights in the local news. Come join us on April 11, 2019 for an evening of dancing and socializing with our fabulous students. Prom begins at 6pm to 10pm at the recreation center. Find the Hero in you – Donate blood on March 6th! NMSBVI will be hosting a blood drive on Wednesday, March 6th from 10:00 am to 2:00 pm in the mobile unit. If you would like to sign up please contact Danette Shields at (575) 439-4473 or email DanetteShields@nmsbvi.k12.nm.us . Drawing will be held on Thursday, March 21 at 1pm in the cafeteria (need not be present to win). Raffle tickets can be purchased from NMSBVI Seniors (Andres, Nadine, or Omar), and Senior Class Sponsors (Kim Tryon or Randal Martin). 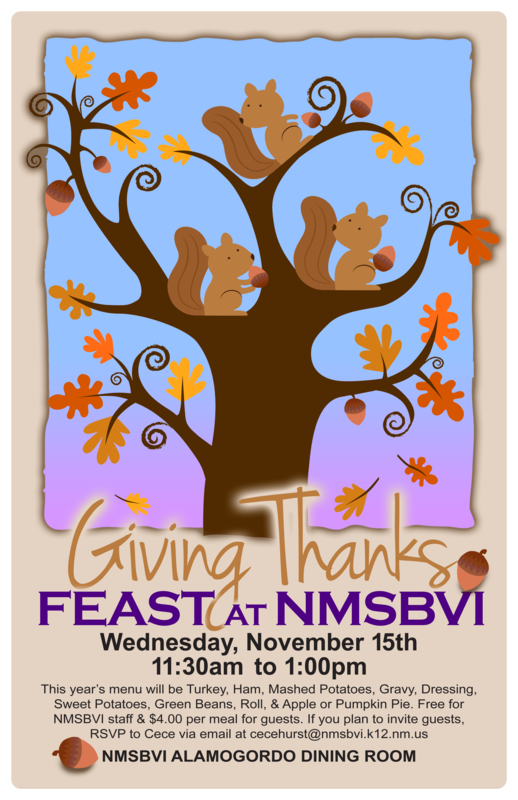 Please join us in the Dining Room for a special luncheon prepared for you by NMSBVI STUDENTS & Food Service staff! Chicken Cordon Bleu with a Dijon Cream Sauce on Angel Hair Pasta, with Asparagus, Roll, & Cheesecake. Please note that staff will be charged the same lunch rate as on regular days; and there will be a $4.00 charge per meal for guests. RSVP to Cece via email at cecehurst@nmsbvi.k12.nm.us. Steinmann Prosthetics & Orthotics will be offering a clinic at NMSBVI-Alamogordo Campus. Please call (575) 532-5900 to schedule an appointment. Please join us on January 24 from 6pm-7pm via “Zoom” (internet), phone, or in-person, to learn more about the Next Generation Science Standards (NGSS) and how NMSBVI will be transitioning our science curriculum to support these new standards. We will also be discussing New Mexico PED’s newly adopted NGSS curriculum options and gathering your input as we move to adopt updated and accessible materials for our 21st century science students. • If you plan to attend in-person at the NMSBVI Alamogordo Campus, please meet us in the Watkins Education Center Science Lab. Steinmann Prosthetics & Orthotics will be offering a clinic at NMSBVI-Alamogordo Campus on the first Tuesday of every month. Please call (575) 532-5900 to schedule an appointment. Bring the entire family to enjoy our lovely campus, decorated in the spirit of the holidays! Caroling at the Gazebo 6-6:30pm. Hot chocolate, coffee, and cookies will be served! Join us for a fun-filled weekend with activities for students and their families to enjoy! 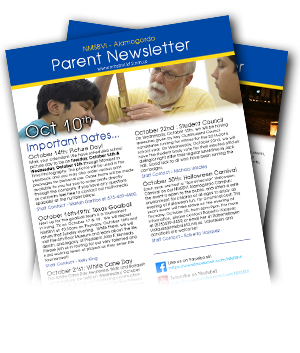 Family Learning Modules: Expanded Core Curriculum, Independent Living Skills; Open Gym with Climbing Wall and Pool; Student Talent Show; Student Panel Discussion; Parent/Teacher Conferences with one-on-one visit with your child’s teacher(s), Technology, And So Much More! Also, this event is open to families for children with blindness or visual impairment who do not currently attend NMSBVI, but who would like to visit the NMSBVI Alamogordo campus and get to know us. Please note that space is limited and pre-registration is required for all families. Registration deadline: October 19, 2018 at 5:00pm. Please contact Brenda Holmes for a registration packet: (575) 439-4433, or email: BrendaHolmes@nmsbvi.k12.nm.us. November 7, 2018 - 3:10 p.m.
Events starts at 3:10pm (8th period) in the Ditzler Auditorium. Please come to celebrate our veterans for all they have done for our country. Tuesday, October 16, 2018 - 1:45 p.m. Please join us as we recognize White Cane Safety Day, to celebrate the achievements of people who are blind or visually impaired! Please mark your calendars! The fun is right around the corner. We want to see everyone there. Tell your friends, family and neighbors! Although there is no admission charge, all games, activities, & the food court operate on Bat Bucks”... so please bring some cash! Visit our new & improved, re-vamped, best-ever SUPER-AWESOME HAUNTED HOUSE!. Find the Hero in you – Donate blood on October 24th! NMSBVI will be hosting a blood drive on Wednesday, October 24th from 10:00 am to 2:00 pm in the mobile unit. If you would like to sign up please contact Danette Shields at (575) 439-4473 or email DanetteShields@nmsbvi.k12.nm.us . Every staff member is invited to join in on the fun during morning movement each morning Please come to the gym at 8:00 to interact with the students. ALL staff are invited, no matter what your job is. Upcoming events to be announced soon... check back for updates! Please join us on Thursday, May 3, in Ditzler Auditorium at 2:30pm. Find the Hero in you – Donate blood on March 7th! NMSBVI and the Rotary Club of Alamogordo will be hosting a blood drive on Wednesday, March 7th from 10:00 am to 2:00 pm in the mobile unit. If you would like to sign up please contact Danette Shields at (575) 439-4473 or email DanetteShields@nmsbvi.k12.nm.us . Come join us on March 28 for an evening of dancing and socializing with our fabulous students. Prom begins at 6pm and Mr. Juan Nambo will be our DJ for the evening. The prom theme this year will be “Hollywood”, it would be so much fun if staff could show up as their favorite movie star. Please join us at either NMSBVI campus for our second Annual event! Please join us as we display and celebrate some of the school’s recent innovations in education! Our staff is involved with so many exciting things happening in NMSBVI classrooms and in various locations around the state... and they’re thrilled by thisopportunity to share their innovations with you! February 24th-26th, 2017, 8:30 a.m.
Students in grades 1-12 from across New Mexico will come to NMSBVI to test their braille skills while competing for prizes. Extra activities include a dance and roller hockey demonstration. For more information and registration, contact Julie Johnson at (575) 439-4432. Disclaimer: The above button will take you to a site that is under construction and may not be easily accessible for blind or visually impaired users. Mondays, 5:00 - 6 p.m. Meetings will be on Monday evenings in the Dining Hall. Students grade 6 -12 are welcome to join. January 17th & 18th, 2:00 p.m. - 4 p.m.
Thursdays, 8:15 a.m. - 4 p.m. Trips will be taken weekly on Thursdays. November 15th, 11:30p.m. - 1:00 p.m.
Events starts at 3:10pm (8th period). Please come to celebrate our veterans for all they have done for our country. • Family Learning Modules: Expanded Core Curriculum, Independent Living Skills, Play-Based Learning, Technology, and others. This weekend event is open to current NMSBVI program students and their families... and it’s ALSO open to families of children with blindness or visual impairment who do not currently attend NMSBVI, but who would like to visit the campus and get to know us. Please note that space is limited; and pre-registration is required. If you are interested in attending the event, please contact Brenda Holmes at (575) 439-4433, or email: BrendaHolmes@nmsbvi.k12.nm.us. Deadline to register is Wednesday, October 25, 2017. Give Hope! You can make a difference – Donate blood on October 18th! NMSBVI and the Rotary Club of Alamogordo will be hosting a blood drive on Wednesday, October 18th from 10:00 am to 2:00 pm in the mobile unit. If you would like to sign up please contact Danette Shields at (575) 439-4473 or email DanetteShields@nmsbvi.k12.nm.us . Although there is no admission charge, all games, activities, & the food court operate on “Ghost Bucks”... so please bring some cash! Visit our new & improved, re-vamped, best-ever SUPER-AWESOME HAUNTED HOUSE! Parking is limited due to construction. Please obey all signs & orange roped-off areas. Thursdays, 4:00 - 5 p.m. Meetings will be on Thursdays in the Life Skills Classroom. List of Residential Campus Registration Dates. The committee will meet in the Quimby Gym. Students will not attend classes this day. Steinmann Prosthetics & Orthotics will be offering a clinic at NMSBVI on Sept. 6th, 2016. Please call (575) 532-5900 to schedule an appointment. On Tuesday, October 4th, from 11:00 a.m.-1:30 p.m., Key Club/Student Council Elections will take place in Jack Hall. All students are cordially invited to vote after they have finished their lunches. There will be signature sheets and ballots in print and Braille. If a student is unable to vote during this period of time, they will be provided an Absentee Ballot. The election results will be announced on Wednesday, October 5th at 8:00 a.m. during morning announcements. The Burro Flats Volunteer Fire Department will come to the Alamogordo campus to teach students about fire prevention and safety. They will bring educational materials and equipment to demonstrate for our students. This activity is part of the National Fire Prevention Week. The event is scheduled between 10:30 - 11:15 a.m.
NMSBVI of Alamogordo will be hosting a blood drive on Wednesday, October 19th from 10:00 am to 2:30 pm in the mobile unit. If you would like to sign up please visit United Blood Services Appointment Website link for more information. We will be opening our campus to the community once again for our Halloween Carnival! We will have candy, games, food, snacks, and even a Haunted House. In the past years students did a wonderful job preparing our campus for the evening's events. We even saw some adults come out of the Haunted House frightened. We are looking forward to seeing everyone in costume! Although there is no admission charge, all games, activities and food will require purchase. All proceeds benefit the Senior class Activities fund. Students and Staff will celebrate together before the Fall Break begins. Students will leave campus on November 18th to begin Fall Break. They will remain at home until November 27th when they travel back to campus in time for classes to begin again. It won't be much longer until Winter break! Students will be holding a "Toys for Tots" drive and collecting donations of new toys and stuffed animals. The toys will be distributed to children in need in the Otero County Community. Donations are appreciated. The NMSBVI Christmas Program will be packed full of talent and jingle bells to ring in our Christmas season. Students have been practicing in music class and in private sessions to perfect their act and bring us all joy as we watch them on stage. From silvery voices to the instruments they are mastering, each year brings new talent to impress us. The performance will be held at 2:30 p.m., in the Bert Reeves Auditorium. In the woodshop, students have been making a myriad of woodworking projects, ranging from pens, magnifying glasses & letter opener sets, to cutting boards. These items will be bid on through silent auction during the week of December 8th, with culmination of the bidding occurring during the Holiday Sampler Event on December 9th. Bidding will end Dec. 8th @ 3:45 p.m. Letters will go home to parents on Dec. 2nd, to allow you to enter a bid on your child's project if you would like. Things are a bustle of activity in the Life Skills Program this time of year. Preparations have already started to make the most delicious appetizers and desserts for the 7th annual Holiday Sampler. Each secondary student is responsible for picking recipes and making the item of their choice. Join us in WEC to taste these wonderful treats. NMSBVI will take part in this annual tradition, and will have a float representing the school in the parade. Students and Staff will celebrate together before the Winter Break begins. Key Club/Student Council is sponsoring a raffle. Get your tickets from any club or council member ($1 per ticket). The drawing will take place on December 15th in the dining hall. First prize is a Large Butterball Turkey, Second prize is a ham, and third prize is a basket of assorted fruits and snacks. All proceeds from this raffle will help pay the costs of of some of the upcoming student activities such as the Senior Prom, Senior class gift,"Rowdy-O" and the end of the year banquet. Students will leave campus on December 19th to begin Winter Break. They will remain at home until January 3rd, when they travel back to campus in time for classes to begin on January 4th again. It won't be much longer until Spring break! In observance of the federal holiday, there will be no school. Delicious delicacies are up for grabs! Will you get the cake of your dreams? Come by and find out! NMSBVI of Alamogordo will be hosting a blood drive on Wednesday, March 1st from 10:00 am to 2:00 pm in the mobile unit. If you would like to sign up please visit United Blood Services Appointment Website link for more information. Get excited about Science, Technology, Engineering, and Math (STEM) as we explore Creativity, Innovation, Collaboration & Teamwork through Hands-on Interactive Activities & Challenges! The Key Club/Student Council are taking donations of new or gently used clothes. Donation boxes can be found in most buildings on the Alamogordo campus. The Key Club/Student Council are hosting a spring themed raffle. "First Annual Glow Ball Golf Tournament"
Come out and compete in the second annual Glow Ball Golf Tournament! This benefit will take place at the Desert Lakes Golf Course. Proceeds to benefit the NMSBVI Foundation. It is Spring Break! No school will be held on the Alamogordo Campus from April 3rd to April 7th. Note: All Practices will be held on Tuesdays and Thursdays in the Gym from 4:00 - 5:00 p.m.